Facts about Tuliptree, "Scientific name for Tuliptree is Liriodendron tulipifera". Tuliptree is a species of large deciduous plants that belong to the magnolia family. The name Tuliptree is derived from the appearance of its flowers that are large and resemble tulips. However, they do not have any relationship with tulips. In other circles, the Tuliptree is referred to as the yellow poplar or tulip poplar and whitewood. Tuliptree is native to the eastern part of North America. A similar species known as Liriodendron chinense is native to Vietnam and China. Each of these species grows to a great size it can grow up to 105 feet (32 meters) in height. The American species has horticultural use and often times, hybrids have been produced between these species and the Chinese species. The leaves of the Tulip Tree are the most distinctive parts of the tree. The Tulip Tree has four lobes and their apex is straight or cross-cut notched. The size of the leaf varies from 3 to 8 1/2 inches (8 to 22 cm) in length and 2 1/2 to 10 inches (6 to 25 cm) in width. A Full grown Tuliptree can absorb as much as 48 pounds (21.77 kg) of carbon dioxide a year. The same Tuliptree could also produce enough oxygen in a day for two people. In a single day, a large Tuliptree can drink up to 100 gallons (378.5 liter) of water from the ground and discharge it into the air. You can tell a Tuliptrees age by the number of growth rings. Growth rings size shows what kind of conditions accrued that year, the temperature and if it was a dry or wet year. The Tulip Tree is often large in size with a height to 105 feet (32 meters) branch leanghts between 30 and 50 feet (9.14 to 15.24 meters). 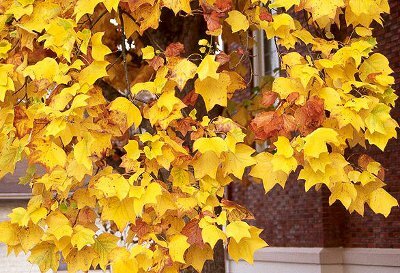 The trunk of the tulip tree is columnar with a branch-free bole that forms a compact crown. The roots are deep and widely spread. The leaf sizes of the Liriodendron chinense are larger when compared to the L. tulipifera species. The leaves of young Tuliptrees are usually lobed and are larger in size when compared to those of mature trees. Tuliptree leaves are made up of many colored pigments, green chlorophyll hides the colors during the growing season of spring and summer. As days get Shorter and cooler temperatures come in the fall, it cause the chlorophyll to break down and than the other color pigments can be seen. Tuliptree growth is referred to as Meristem (The undifferentiated embryonic plant tissue from which new cells are created, as that at the tip of a root or stem). This tissue can be found at the tips of shoots and leaves. Inside the stem growth in thickness occurs at the vascular cambium. Tuliptrees make their own food from sunlight, carbon dioxide, water, and nutrients from the soil. The flowers of the Tuliptree have a diameter that measures between 1 1/8 to 4 inches (3 and 10 cm) with 9 tepals- six inner petals and 3 green outer sepals. The flowers start forming after a period of about 15 years and resemble a tulip. L. tulipifera have a characteristic cucumber odor. The pistils and stamens are arranged in a spiral manner surrounding the central spike. Bark of the Tuliptree protects it from the elements and is made up of dead cells. Tuliptree roots usually grow two to three times the width of the tree branches. The ideal time to fertilize your Tuliptree is in late fall or early spring. If you want to transplant a tree do it in fall, this is ideal for most trees.